MOSCOW - Russian President Vladimir Putin turned 62 today and, as they do every year, many Russians organized over-the-top tributes in celebration. In St. Petersburg, a children's choir recorded a highly produced music video, literally singing Putin's praises. "May you have many more years with the same strength in your heart," the children sang. In Moscow, a pop-up art exhibit portrayed Putin as the Greek god Hercules. Just like Hercules slayed the multiheaded hydra and tamed the Cretan bull in Greek mythology, Putin is depicted defeating Western sanctions and annexing the Crimean peninsula. 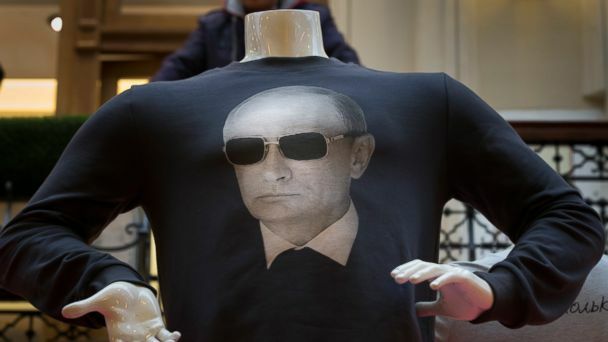 At GUM, an ultrahigh-end Moscow shopping center, customers lined up for hours to purchase Putin iPhone covers and $75 sweatshirts of the Russian president in his manliest of moments. "I want them all," exclaimed Nina Zabolotskaya, a hotel employee who was waiting in line. "I like Putin. I love my president." When asked whether the prices were too steep, she said, "for the president, no." In the Chechen capital of Grozny, over 100,000 people marched, wearing the colors of the Russian flag, according to Russian state media. Chechnya's strongman leader Ramzan Kadyrov, a Putin ally, claimed on Instagram that the crowd set a world record for the largest "living" flag. ??????? ??????! ???? ???????? ??? ?????? ???????! ??????? ? ??????? ?????????? ????? ??????? ?????? ?? ???????? ?????? ???????????????? ????? ? ??????????? ????????????? ? ???? ?????! ????? ?????? ?????? ? ????? ????????? 2000 ???. ??????, ? ??????? ? ???? ????? ??????? ????? ??? ?????? ?????? ? ???????. ??? ???????? ????????? ?????????? ?????? ????????? ?????? ? ?????????? ??? ? ???? ????????! ?????? ?, ???????????? ????????? ?????? ? ???? ?, ??????????? ?? ??????? ??????? ?? ?????? ????????. ??????? ???? ???? ????? ? ???????????? ???????? ? ?????????? ?????? ? ????????. ? ? ???????? ???? ??????? ?, ??? ??? ???????? ? ???????? ???????? ? ???????????? ??????! #??????? #????? #?????? #????? #???? #?????? #???????? Meanwhile, back in Moscow, a pro-Kremlin art group calling themselves "Impolite People" draped a giant banner from a bridge opposite the Kremlin showing President Obama wearing a Putin shirt that says, "Happy birthday global daddy." A Russian lawmaker recently suggested making Putin's birthday a national holiday. He remains wildly popular in Russia and his approval ratings have been well north of 80 percent since he annexed Crimea. The numbers have stayed high as he is seen defending Russia from outside forces. As for Putin himself, he marked his birthday far away from the madness. The Kremlin said the Russian leader was taking the day off, the first time he's done so for his birthday in 15 years in power, and is spending it in the Siberian wilderness hundreds of miles from civilization.